Building on the grammar elements learned in Spanish II, students will increase and reinforce their knowledge of verb tenses, continue to build vocabulary, and improve conversational ability in different settings. In this course students will be challenged to read and write more in Spanish. Students will also learn more about the cultures in which Spanish is spoken to be able to fully communicate with Spanish speaking people. This course is eligible for dual enrollment credit for junior and senior diploma students. Homework will average 3 - 4 hours per week. Spanish III is taught by an expert instructor in the Veritas Virtual Classroom and is limited to only 20 students per course. Courses begin September 5th and end May 18th. To view the complete Academic Calendar click HERE. Minimum age of 14 on the first day of class. Successful completion of VSA Spanish II or comparable course in the previous 24 months is strongly encouraged. 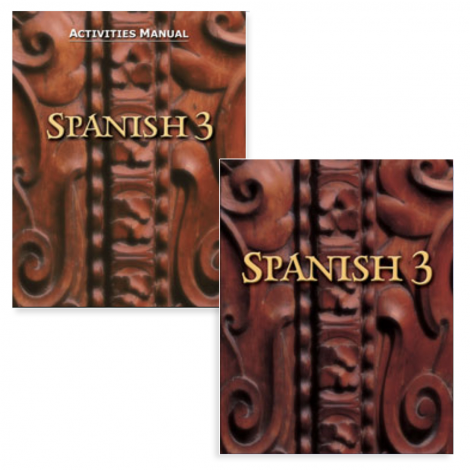 Spanish III Course Kit (003585) The Course Kit contains all the items listed below it at a discounted rate.